This article has been seen 49166 times. We pick only cedar cones which fall naturally from the trees, thus ensuring that only ripe cones are selected. We always avoid hitting the trees to shake unripe cedar cones down (as happens with some other commercial operations) — a practice which causes the nuts to lose their healing power. A lack of observance of food hygiene (a disruption of the schedule and quality of nutrition) exerts the most immediate and at the same time undesirable influence on the system of the digestive organs, and first and foremost on the functioning of digestion, the stomach, and the duodenum. Ranking first must be such a negative factor as overeating, which, even in the case where it is well tolerated over a long period of time, in the end always provokes stomach upset. In the beginning, these disruptions are primarily functional and curable in the early stages. However, the real threat to health arises when metabolic disorders (obesity, diabetes mellitus, gout, and others) are added, and a metabolic syndrome develops. Second, yet another of the reasons for the dysfunction of the organs of the digestive system is the deviation of the actual diet from the recommended balanced standards: insufficient consumption of fresh vegetables and fruits, products of animal origin, excessive consumption of carbohydrates, poor knowledge in matters of the proper structure of the food allowance, carelessness in eating (eating on the run, while on public transport, primarily "fast food" products), following "trendy" and often "extreme" diets. Third, together with this in modern conditions an increasingly greater significance is acquired by a group of objective reasons. Among them an essential role is played by the significant increase in the use of refined, high-calorie products (white bread, margarines, and others), which are practically devoid of vitamins and other irreplaceable food substances. As a result of these tendencies, the food allowance of the modern person, sufficient (and even excessive) to cover expenditures of energy, turns out to be unable to provide for the recommended standards for the consumption of vitamins. This creates conditions for the occurrence of cases of polyhypoavitaminosis, that is, conditions where a deficit of several vitamins gradually occurs. Clinically this may manifest itself in the development of the syndrome of functional dyspepsia. In the structure of disorders of the digestive organs, functional upsets occupy one of the central areas, and are responsible for approximately 25 to 30% of the cases (Frolkis, 1991). They are characterized by a variety of clinical symptoms, lengthy duration, and quite often manifest themselves with diverse painful sensations (Ivashkin, Trukhmanov, 2000). These conditions usually lead to a worsening of patients' quality of life, and the therapeutic measures carried out prove to have little effect. In addition, against this background, the risk of the development of an organic pathology substantially increases (Frolkis, 2000). Modern medicine has in its arsenal various methods of treatment, and a central place among them is occupied by drug therapy. A huge spectrum of pharmaceutical preparations is a sufficient guarantee for effective treatment, however it should be admitted that, in real life, confirmation of this is far from always being found. The lengthy period of treatment with drugs quite often becomes the cause of the development of various complications. However, there exist other principles and methods, which, while a important component of modern medicine, have not been developed as they should be. These are non-medicinal methods of action for the treatment and prevention of illnesses. Together with this, non-medical methods of treatment are an effective means of increasing the protective and adaptive mechanisms, training the adaptational systems, restoring disruptions of the body's functions by acting on metabolic processes, the vegetative nervous and endocrine systems, and the external regulatory centres of the nervous system (Kuimov et al., 2007). With this in mind, wide use may be found for the biologically active additive Siberian Cedar Nut Oil, which possesses a high therapeutic activity in inflammations of various origins (Filchenko et al., 1993). 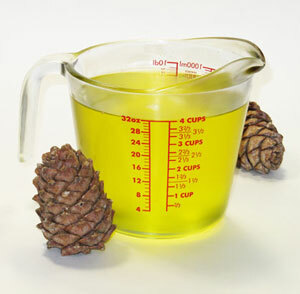 The biologically active additive Siberian Cedar Nut Oil produced under the Ringing Cedars of Russia trademark is a natural product that is a naturally occurring concentrated source of vitamin E, and also contains a large quantity of polyunsaturated fatty acids (linoleic, oleic, and others), which are not synthesized in the human body and may enter the body only with food. The composition of Siberian Cedar Nut Oil includes a significant quantity of B group vitamins: B1 (thiamine), B2 (riboflavin), B3 (vitamin PP), which exhibit high physiological activity. 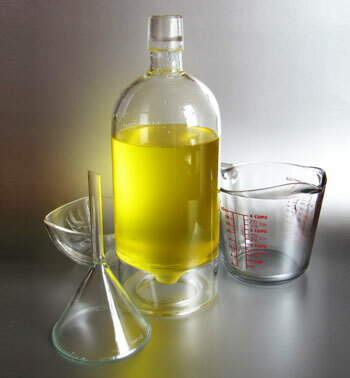 The biologically active additive Siberian Cedar Nut Oil produced under the Ringing Cedars of Russia trademark contains phosphatide phosphorus, which is very important for the body. Its biological value is also determined by its high content (more than 20) of vitally important trace elements: potassium, magnesium, manganese, calcium, copper, cobalt, zinc, iodine, nickel, molybdenum, iron, and others. It also contains up to 5% nitrous substances, of which 90% are amino acids, primarily essential amino acids (up to 70%). The purpose of this paper was the study of the effectiveness of using the biologically active additive Siberian Cedar Nut Oil produced under the Ringing Cedars of Russia trademark in the comprehensive treatment of patients with a pathology of the digestive organs and its influence on their quality of life. The clinical trial was conducted in a random population group in outpatient conditions. In total, 22 persons from 20 to 52 years of age (the average age was 37.2 +/- 2.4 years) were included in the trial. The persons studied belonged to the category of students (5 persons) and employed persons (17 persons). All of the persons observed had a pathology of the digestive organs. Gastroesophageal reflux disease was observed in 8 persons; erosive gastroduodenitis, in 9 persons; peptic ulcer of the stomach and duodenum, in 4 persons; and postoperative stomach disease, in 1 person. The study was conducted in accordance with the "Rules for clinical practice in the Russian Federation," which were approved by Order No. 266 of the Ministry of Health. Each patient observed signed an informed consent form. The patients were observed at the stage of an exacerbation of their disorder and received basic treatment for their primary illness (proton pump inhibitors, cholinolytics, antacids, prokinetics). 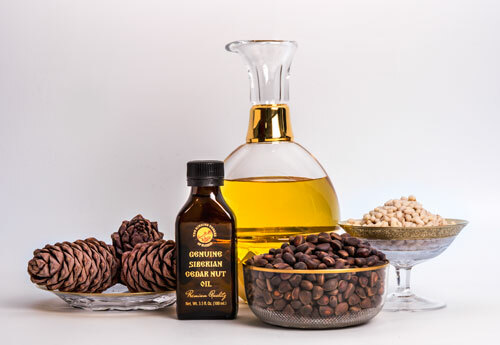 Siberian Cedar Nut Oil produced under the Ringing Cedars of Russia trademark was included in the comprehensive treatment for all patients, one teaspoon to be taken 30 minutes before eating three times a day. The course of treatment was 20 days. 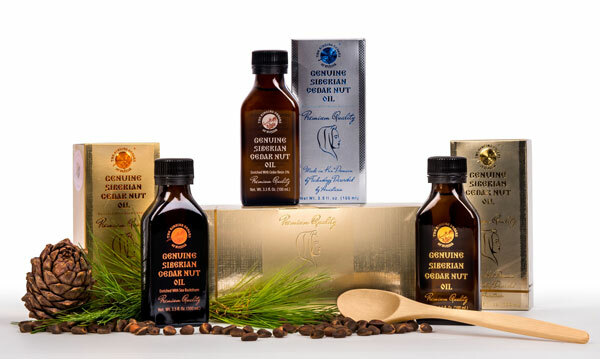 The oil of Siberian cedar nuts bearing the Ringing Cedars of Russia trademark has a certificate of quality and safety, which is confirmed by Certificate of Conformity No. ROSS RU.AYa79.V05813, issued by the Novosibirsk Centre for Product Certification and Quality Monitoring (Test Report No. 1163 dated 19 March 2007). The oil of Siberian cedar nuts is a thick, transparent liquid, light yellow or golden amber in colour, with a nutty aroma. For the evaluation of the criteria of the effectiveness of Cedar Nut Oil of Ringing Cedars of Russia Trademark, a standard questionnaire for the evaluation of the quality of life was used -the Nottingham Health Profile, which evaluates the most significant parameters that describe a person's quality of life: energy level, pain, emotional reactions, sleep, social isolation, and physical abilities. All patients were surveyed prior to beginning taking the preparations and after 20 days. The results of the trials are presented in the table. Following the appearance of disease, in persons 20 years of age in the group under study (5 persons), the lowering of the quality of life indicators was minimal. Following the course of treatment with Siberian Cedar Nut Oil bearing the Ringing Cedars of Russia trademark, a reliable improvement was noted (P<0.05-0.02), as was the full restoration of the evaluated quality of life parameters. There was practically a complete restoration of such parameters such as emotional reactions, energy level, and physical abilities. Following the appearance of disease in persons in the older age groups (17 persons from 31 to 52 years of age), the lowering of the quality of life indicators was more significant. 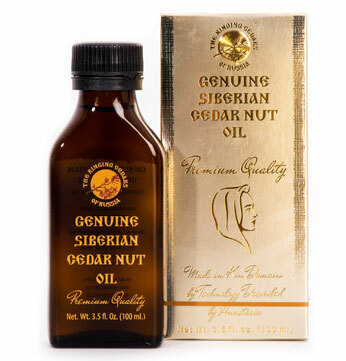 However, on the completion of the course of treatment with Siberian Cedar Nut Oil bearing the Ringing Cedars of Russia trademark, a significant and reliable improvement (P<0.001-0.05) was noted in the quality of life indicators. As a whole, in the entire group of persons studied, the most noticeable improvement was observed in the improvement of emotional reactions and what was especially remarkable, a restoration of sleep was noted (see the Table). In addition, according to the results of the FGS conducted, a reduction of inflammatory elements in the stomach mucosa and the duodenum was noted, as was the healing of ulcers and erosions in the stomach. Thus, the tests conducted by us demonstrated that the biologically active additive Siberian Cedar Nut Oil produced under the Ringing Cedars of Russia trademark used in a course of treatment has a positive effect in the complex therapy of illnesses of the digestive organs and promotes an increase in the level of the quality of life. Secondary reactions in the course of treatment were not observed. This leads one to recommend the use of the biologically active additive Siberian Cedar Nut Oil produced under the Ringing Cedars of Russia trademark as an effective means for increasing health reserves and for the preventive treatment of disorders of the digestive organs, its use is especially effective in the treatment of erosive ulcerous lesions of the stomach. Filchenko, E.I., Nizkodubova, S. V., Karpitskiy, V. I., Petrenko A. G. "Maslo kedrogo orekha v lechenii gastritov, erozivno-yazvennykh porazheniy zheludka i dvenadtsatiperstnoy kishki" [Cedar nut oil in the treatment of cases of gastritis, and erosive ulcerous lesions of the stomach and duodenum]. Metodicheskie rekommendatsii [Methodological recommendations]. Tomsk, 1993. Frolkis, A. V. Funktsionalnye zabolevaniya zheludochno-kishechnogo trakta [Functional disorders of the gastrointestinal tract]. Leningrad, 1991. Frolkis, A. V. Sovremennaya farmakoterapiya v gastroenterologii [Modern pharmacotherapy in gastroenterology]. Leningrad, 2000. Ivashkin, V. T., Trukhmanov, A. S. "Bolezni pishchevoda" [Diseases of the esophagus]. Patologicheskaya fiziologiya, klinika, diagnostika, lechenie [Pathological physiology, clinic, diagnosis, treatment]. Moscow, 2000. Kuimov, A. D., Polyakov, Ya. V., Krivosheev, A. B., et al. Ozdorovitelnoe and lechebnoe primenenie mineralnoy vody Karachinskaya [Health-related and medical application of Karachinskaya mineral water]. Novosibirsk, 2007.